University Children’s Health Heart Center Now Open! University Children’s Health Heart Center features rooms where children can receive both regular and ICU-level care, and hotel-like rooms and living spaces for families. When an infant or small child undergoes surgery to correct a congenital heart defect, the fear and anxiety felt by parents is compounded by the stress of spending weeks in the hospital with them, often far from home. 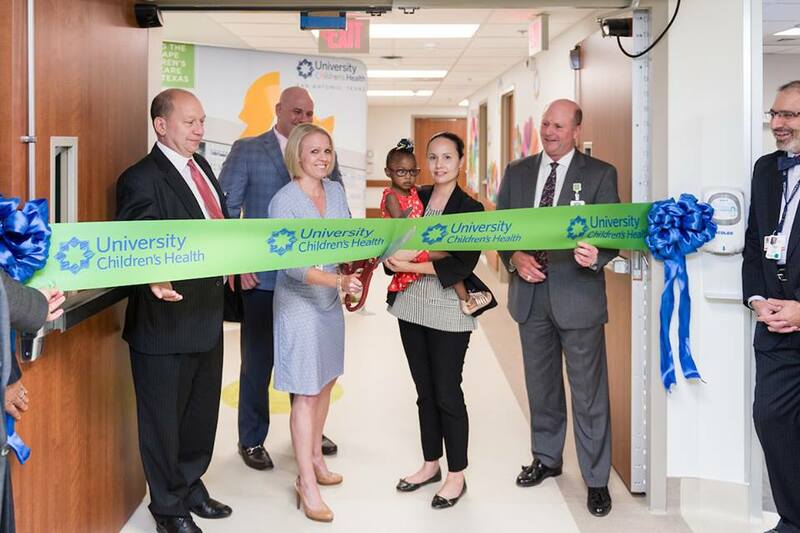 On April 18, the new University Children’s Health Heart Center opened on the ninth floor of University Hospital. The Heart Center brings together both inpatient and outpatient care for children with heart problems in one location. It also includes one of the most innovative inpatient units of its kind in the nation, designed to encourage healing and make long stays by children and families more comfortable. University Children’s Health Heart Center grand opening on April 18th, 2017. Photo courtesy of University Health System. Within the Heart Center, the Pediatric and Congenital Cardiac Care Unit, or PCCU, features 18 “variable acuity” rooms capable of intensive care, but with the features and amenities of a regular room. That means in most cases a child will remain in the same room, with the same nurses and staff, throughout his or her stay. Research has found that variable acuity rooms lead to better outcomes and fewer medical errors. And patients, families and staff vastly prefer the model. Parents have the option of staying in one of four hotel-like rooms on the unit, with an adjoining kitchen, living area and library, to make extended stays less disruptive. Thanks to a grant from the William Randolph Hearst Foundation, each room contains an iPad loaded with information about that child’s particular heart problem, along with a favorite movie or game if desired. The Heart Center’s surgical outcomes for children with congenital heart defects are among the best in the country. The number of young surgical patients treated there each year from throughout Texas has increased by more than 40 percent since 2014. And as the local host for the philanthropic HeartGift program, the Heart Center provides lifesaving heart surgeries to children from developing countries.